Subscription retail is one of the most rapidly growing e-commerce industries in the United States. According to a 2016 Hitwise report, traffic to subscription box sites has grown by nearly 3,000 percent in the past three years—and 56 percent of web visits are coming from smartphones and tablets. I recently spent time dwelling in this industry while researching The 2017 User Engagement Top 100 Report: Subscription Retailers. I studied the best practices of leaders in food and drink, beauty and grooming, fashion, and lifestyle subscriptions. My key takeaway is that the leaders are all taking an omni-channel approach—which aligns with the habits of younger consumers. The prevalence of mobile devices today means that young people can read their emails from anywhere at anytime (70 percent of millennials check from bed). The secret of marketing to this mobile, tech-savvy generation lies in the experience itself: Drive engagement by using sophisticated, cross-channel marketing technology, mixed with a fun, multi-touch approach that brings delight and entertainment to each individual as they journey through their day. Picture this: A hip college student stumbles across your fashion brand, gets deeply excited by what you offer, immediately signs up to your email newsletter—then hears nothing for days. Tumbleweeds drift by. This is a missed opportunity. As we conducted our study, we found that only seven percent of the top 100 subscription retailers sent three or more welcome messages. This is a staggeringly low number for an industry that has grown by 200 percent per year since Birchbox was founded in 2010. The leading fashion subscription Le Tote is one company that nails the welcome email series: when we signed up for email communications, we received three onboarding messages over four days, explaining how the service works, top reasons to join and the company’s origin story. Set yourself apart and encourage subscribers to go further down the funnel: by following on social, setting up a wishlist, signing up for additional notifications and more. Today’s email technology has moved far beyond simple header graphics: smart marketers can build fully interactive email campaigns with animated graphics and embedded videos that will delight their consumer base. For example, to promote a limited-edition box related to Netflix’s Stranger Things, Loot Crate used an animated header that echoed the show’s title credits. The mirrored effect to match the show’s alternative reality, known as “The Upside Down,” is a superb added touch. The Google-raised generation expects a huge degree of personalization in their marketing—so you’ll need to be using smart platforms that allow you to segment subscribers on the fly. If potential customers have been to your website and browsed products or blog posts, segment them in real-time based on their interests and show that you know what they really like. This will make your brand feel genuine and human. Pairing your email marketing efforts with mobile messaging is a highly effective way to grab your audience’s attention. SMS messages have been known to achieve an open rate of 90% within three minutes, so send the occasional text to let customers know when their package is on its way, or if you have a free gift for them to claim. If you have an app—and you should if you want to reach today’s teens—push notifications are ideal for alerting customers when their order is out for delivery or if you’re offering a brief flash sale. Both channels are highly effective, but can get annoying fast, so use sparingly and allow easy opt-outs. By taking any awkwardness out of this encounter, they bring the customers in close through comedy. 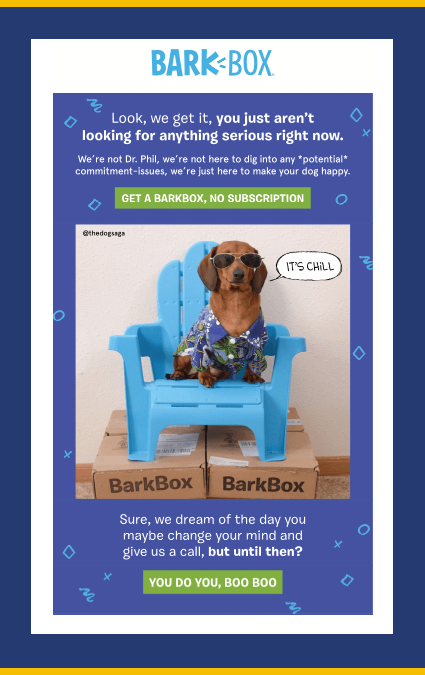 BarkBox also allows people to buy boxes without subscriptions, so be aware that various business models can be used to keep customers coming back for more. One might expect a consistent standard among leading subscription retailers, but our research shows that while some are executing sophisticated campaigns, others just cover the basics and the rest range widely in between. As a collective whole, however, there is much room for more effective customer engagement. To set your business up for success, our latest User Engagement Report covers the most important tactics to increase your customer lifetime value, strengthen brand loyalty and improve your win-back rates. You can learn more about the top 100 subscriptions and take an assessment to see how your marketing stacks up by visiting iterable.com/subscriptions. Iterable empowers growth marketers to create world-class user engagement campaigns throughout the full lifecycle, and across all channels. Learn more at iterable.com. Iterable will be sharing their insights into subscription box services at YMS17 NYC this October.